← Will My Insurance Pay For Auto Glass Windshield Replacement Or Repair? The first automobile owners in Houston never rolled down auto glass windows or cleaned their windshields. That is because their cars did not have auto glass. Thus, without any glass, the city’s goggle-wearing drivers and passengers were vulnerable to any insects or objects that whizzed through the air. The car windshield debuted in 1904. Constructed out of plate glass, it could fold horizontally. For the next decade, though, windshields — along with headlights and speedometers — were optional. Oldsmobile made automotive history in 1915 by including windshields as standard features. By the late 1910s, windshields were prevalent but far from perfect. They often shattered, and drivers occasionally died when collisions forced them through their windshields. Around this time, Henry Ford began seeking a cheaper and safer windshield. He asked Clarence Avery, his company’s leading mechanical genius, to devise a new way of manufacturing glass. Avery partnered with engineers at the British firm Pilkington to develop a system whereby machines rolled, ground, and polished molten glass. Laminated glass was the next major development. French inventor Edouard Benedictus noticed in 1903 that the compound cellulose nitrate kept his beaker from shattering when it fell. By inserting a cellulose layer between two pieces of plate glass, he forged a much harder-to-break glass. For his part, British inventor John C. Wood created a similar type of glass in 1905, one that was later sold under the name Triplex. The Ford Motor Company began using Triplex in its cars in 1927. Auto glass improvements came at a rapid clip throughout the 1920s and 1930s. A special urethane started fastening windshields to frames more effectively. The Lincoln Motor Company began supplying police vehicles with bulletproof glass. And in 1934, Chrysler sold the first car with a curved windshield comprised of just one piece of glass. Further, American inventor Carleton Ellis fabricated an artificial resin that could block ultraviolet rays and keep windshields from discoloring; he patented that resin as polyvinyl butyral in 1938. The same year, Pittsburgh Plate Glass premiered Herculite, a form of tempered glass, which is glass that is heated and quickly cooled. Herculite proved more shatter-resistant than its predecessors. During the 1950s, automotive glass became more attractive and even less expensive to produce. The influential General Motors LeSabre, a show car that debuted in 1951, had a panoramic windshield for a better view of the road. By the late 1950s, wrap-around windshields were routine, and tinted versions were fairly common as well. In 1959, Pilkington initiated the float style of glass-making, in which glass components are melted, mixed, and pushed through a narrow opening onto molten tin. The result is cheaper glass that is nonetheless high in quality and exceptionally clear. 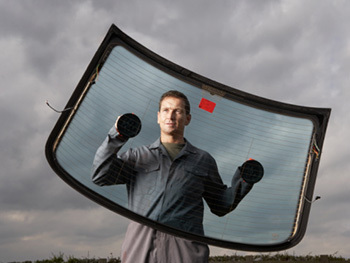 As of the 1960s, the U.S. federal government has regulated windshield strength. Auto glass improvements since that time have included greater ranges of windshield visibility and a 1990s-era film that reduces infrared ray penetration. What does the future hold for this kind of glass? For starters, it is possible that every piece of auto glass — not just windshields and some windows — will be laminated, which will make car rides quieter. In addition, recycled glass should become more common in vehicles, and self-cleaning windshields could be popular options as well. Most exciting, sensors and other digital technologies will yield smart windshields, which will be capable of displaying driving directions and other pieces of information. In fact, General Motors is already working on a smart windshield prototype. Of course, until auto glass can fully take care of itself, Houston motorists will still need experts for their windshield repair and windshield replacement needs — experts such as the friendly and dependable auto glass technicians at Apple Glass Company. Contact us for all of your automotive glass needs.